DeLong, Rosalie Bernice, 84, of Kempt, Queens County, passed away on Sunday, January 19th, 2014, at Queens General Hospital, Liverpool. Born in South Brookfield, she was a daughter of the late James and Ada (Burhoe) Rawding. Rosalie was very active in her community and with her church. 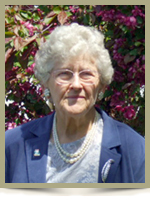 She was a member of the Women’s Missionary Society, Kempt Women’s Institute and a board member at North Queens Nursing Home for over 45 years, Rosalie was also a palliative care volunteer and a member of Home & School for many years. She taught school in Hibernia from 1946- 1947 and at North Queens Rural High School from January of 1969 – June 1969. Rosalie was also well known as the Fuller Brush Salesperson in North Queens for many years. She is survived by her loving husband of 65 years, Donald; daughter Sheila (Terry), of Albany New; son Lowell (Rose), of Stewiacke; two grandchildren; one step grandson; four great grandchildren; one great great grandson; sister Jeannine Wernham, of London, Ontario. She was predeceased by a sister Marilyn and Marilyn’s husband Douglas. Dear Donald and family ,I am so srry to hear of Rosalie’s passing, she was a wonderful lady,often think of her . always think of her when i make lemon pie, she taught me how to make real lemon pie when i was a young girl living with Aunty Pearl and uncle Guy. she will always be remembered for her kindness RIP, dear lady. I’m so glad I got to visit with her last summer when I was on holiday from Montreal. Condolences to Donald and all of the family. within her family. A great community worker , she was never too busy to take part in whatever had to be done. She will be sorely missed. Our deepest sympathy to all of you. Dear Donald, Sheila and Lowell, words cannot express how we feel at this sad time. She was such a good friend and neighbour. I was shocked to hear of her passing and my thoughts and prayers go out to all of you. Rest assured she is in a beautiful place free from all discomfort and pain. She was a hard worker and I always enjoyed her when she was involved in our Senior’s Group of which she was President for a number of years. Take care and may God’s blessing be upon you all. Donald, Sheila and Lowell, We are so sorry to hear of your Mom’s passing. A very knowledgeable lady she was , always took the time to stop and say hello whenever and wherever she met you.. I know personally she always asked me about our children , life in general, the weather. Rosalie was a very community minded lady. Hold her close in your memories . She is smiling down at you and your father. So sorry to hear of your wife’s passing our thoughts are with you on this sad occasion. Donald,Sheila,Lowell and Families,Our thoughts and prayers are with each and everyone of you at this sad time.God Bless Each And Everyone Of You.May your wife mum and grandmother:Rest In Peace. Sorry to learn of Rosalie’s passing. Thinking of you at this sad time, Donald, Sheila, Lowell & families. Feel free to call if there’s anything we can do. SORRY TO HEAR OF ROSALIE’S PASSING. SHE WAS A WONDERFULL LADY AND IT WAS A GREAT PLEASURE TO HAVE KNOWN HER. OUR THOUGHTS ARE WITH YOU AND YOUR FAMILY. My thoughts and prayers go out to all of your family during this sad time.Rosalie was such a sweet lady! Please accept our deepest sympathy in your loss at this sad time. Rosalie was a wonderful Christian lady. She was a special friend to me and I so enjoyed our talks together. She had a great sense of humor of which Paul enjoyed so much.. She is now in the presence of her Lord of whom she dearly loved. May God bless you Donald, Shelia and all your family. Take Care. Please accept our deepest sympathy in you loss at this time. Rosalie was a wonderful Christian lady. She was a special friend to me and I so enjoyed our talks together. She had a great sense of humor of which Paul enjoyed so much. She is now in the presence of her Lord of whom she dearly loved. God bless you Donald, Shelia, and all your family at this time. and family at Barss Corner. Sorry to hear of Rosalie`s passing, our thoughts and prayer`s are with you and your Families at this difficult time. Our condolences to the countless family members and friends who will miss Aunt Rosalie. You did not have to know her long before you saw her strength of spirit. That spirit will be sadly missed, but please know that a part of that spirit survives in all of us whose lives she touched with her wisdom, compassion and humour. My wife, Cathy loves to tell the story of how Aunt Rosalie pulled her aside many years ago, just before we were married, and said, “So, let me tell you what you are getting into by marrying a DeLong man.” We have laughed about it many times since. We will miss Aunt Rosalie very much. We are sorry to hear of the passing of Rosalie,she was a wonderful lady.Our thoughts and prayers go out to Donald,Sheila,Lowell and familys. Ruth and Fred. So sad about the passing of Rosalie.I have known her all my life and she will be missed in our community greatly.Thinking of all the family at this sad time. I wish to extend my condolences on the loss of your loved one. May you find comfort in your memories of times spent together. We are so sorry to hear of the loss of your beloved wife, Rosalie. She was a lovely lady and will be greatly missed by all that knew her. We often think of the lovely Sunday hymn sings around the piano at Harmony Mills. Cherish your great memories forever. Extending our condolences to Donald and family on the loss of Rosalie, we always enjoyed visiting them when out that way, her smile will certainly be missed. Our prayers are with you. Please accept our condolences at this sad time. Rosalie was a lovely lady. Donald, how lucky you are to have had sixty five years together. I hope the many fond memories you have give you strength in the coming days. My deepest condolences. I have many fond memories of the early 70’s and helping the building of the house. Also drives to Kedgi etc. I am sorry to not be able to attend the funeral service as I’m in Pa. on my way to Florida. With you all in thought. Donald and family we are so sorry to hear about Rosalie passing away.she was a good lady to talk to she always have a smile on when she goes anywhere. Sheila we are sorry to hear about your mom .if you need anything or want any thing just lot us know .our thoughts and prayers are with you and your family. Donald,Lowell,Sheila and families: Please accept our condolences at this very sad time. She was a lovely lady Always enjoyed a little chat We as part of her family at the home will miss her dearly. Its a very hard time for Donald but we will give him extra TLC,as he is a very lovely man also. Sheila and family: My heart feels your loss and my memories are of a gentle lady who had a smile and touch, a gift she obviously passed to you. I deeply regret that I will not be able to pay my respects in person but my thoughts are with you. Donald and family: We are so sorry to hear of Roasalie’s passing. We have fond memories of her – she was a lady to be admired. Our thoughts and prayers are with you at this time. It is a heartfelt loss to our family and friends. I always enjoyed Aunt Rosalie’s warm, friendly greetings and the interest she showed in how we were and what was happening in our lives. She was genuine and sincere. I am grateful that Jacob grew to know her and thought her to be a lovely Great Aunt. She was a blessing to us and will continue to be remembered with great fondness. Donald and family: My thoughts are with you at the sad time. When I remember my years in Kempt, the first people I think are are Donald and Rosalie. We were sorry to hear of Rosalie’s passing. She was a kind and thoughtful woman with an inquiring mind. We’re so glad to have known her. We first met Rosalie and Donald when we visited Nova Scotia over thirty years ago and were invited into their home where we had many enjoyable evenings. Rosalie was a very smart, kind and generous lady and will be sadly missed. God bless her and be with her family. She will be always in our hearts. I am sorry to hear of Rosalie’s passing. She was a wonderful, thoughtful lady that cared so much for others and I will miss her dearly at the home. My condolences to Donald, Sheila, and other family members.